Auto California Kush by 00 Seeds Bank is a feminised autoflowering cannabis seed that has its origins in the cross of a Californian Kush and a Ruderalis. 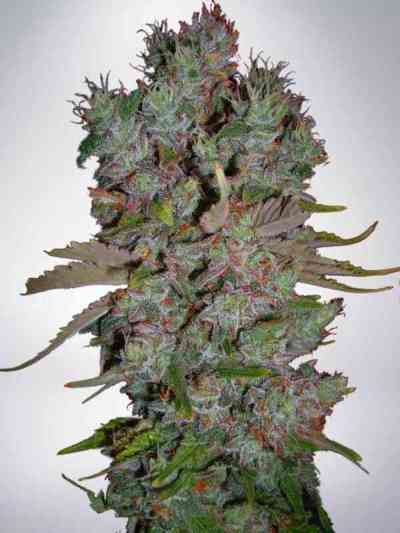 It is a medium sized strain, that uses it's quick and easy cycle to form into a Christmas tree like appearance. Its many branches holds lasting flavour with a Kush aroma. It is easy-to-grow marijuana plant that produces generous crops of big, compact and resinous buds. This Indica-dominant hybrid is the automatic version of California Kush, a new creation that is sure to delight Kush lovers. Despite growing well indoors, it thrives when outdoors. Breeders may even have the chance to harvest it more than once, as long as the region's climate is the ideal one. It must also be noted that it has proved to be far more powerful than most autoflowering strains. It is advisable to add a 30% of coco coir to the substrate and to water it frequently but moderately. The flavour and aroma of Auto California Kush are intense, with hints of fuel, lemon and ripe fruits. It provides a powerful and physically relaxing effect of long duration.